Tsukune is a term that means “kneaded and shaped into a round shape”. It usually means a dish made with finely ground and flavored chicken or fish. Chicken tsukune are very well suited to bentos, since they are soft and stay nice and moist. They are also gluten-free (no breadcrumbs! ), if you take care to use a gluten-free cornstarch or potato starch and soy sauce. Where I live, I can’t normally get ground chicken, which is a standard item in Japanese supermarkets. But that’s ok, since I’d rather grind my own chicken anyway. 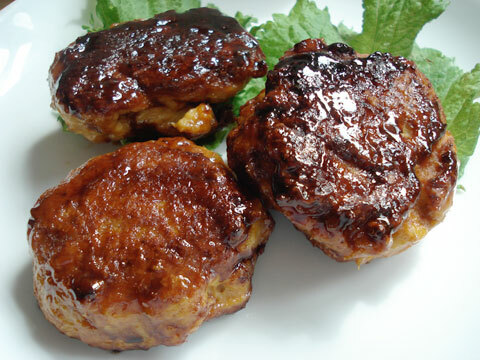 I use skinned and boneless chicken thighs, which have enough fat to keep the tsukune moist. If you have a food processor, this is a breeze to make; if not, you will have to buy ground chicken or get a butcher to grind it up for you. 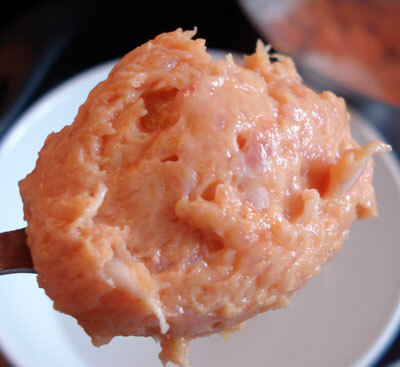 Put the chicken thighs in the bowl of a food processor. Pulse several times to ground coarsely. Add the rest of the ingredients, and process until a smooth paste is formed. You may need to scrape down the bowl a couple of times. Put everything in a small pan and bring to a boil. Using two teaspoons, form the tsukune mixture into small balls (they’ll be sort of rugby ball (American football) shaped, like quenelles) and drop them into the broth. Wetting or oiling the spoons will make the tsukune mixture less sticky. As you can see, the dough is a bright orange-pink color from the carrot and dark meat. Just let it boil away until the carrots are cooked through, about 15 minutes, stirring carefully a few times. To pack in a bento box, strain off the broth, then drizzle just a bit of it on top. Stewed tsukune keeps, well covered, in the refrigerator for 2-3 days. They also freeze nicely, with a bit of the broth. Just defrost them in the microwave. 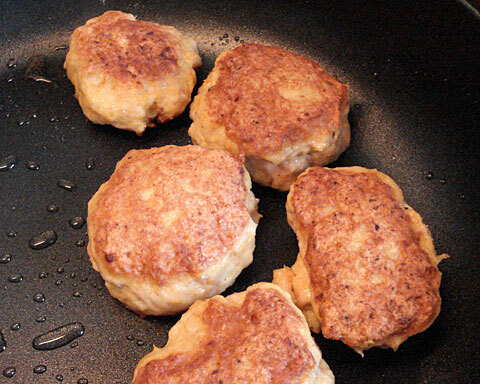 Tsukune burgers are very light and soft, almost fluffy — a nice change from burgers made from beef. Make small burger shapes using two tablespoons, and panfry them with a little bit of oil in a nonstick frying pan until golden brown on both sides. They are great as-is, but I added a tablespoon or so of oyster sauce to glaze/sauce them. You could also combine equal amounts of mirin, sake and soy sauce with a pinch of sugar for a more traditional teriyaki-type glaze. Tsukune burgers also freeze well. I freeze them unglazed. To defrost, put into an unoiled nonstick frying pan over low-medium heat, put on a tight fitting lid and steam-cook them until warmed through. This only takes a few minutes. Add the glaze or sauce of your choice at this point. hi maki, these recipes look really great. i started preparing bento lunches right when you started this blog - a happy coincidence for me! i’ve become a big fan of justbento & justhungry, i really appreciate your well-balanced style: a lot of good sense and pragmatism, and at the same time it’s elegant, clever and also friendly! thanks for all the recipes and tips and thoughts that you share with us! please continue like this! Fri, 2008-08-08 22:42 by anon. actually, the stewed tsukune dumplings are terrific in a matzo ball soup! I love the similar-yet-different textures and tastes of the matzo balls and tsukune. Boy I love chicken, that’s why I’m loving this recipes more than usual! I always visit your blog, but i seldomly make anything, what with lacking ingredients or money (student here) but this chicken recipes, I have to try! thank you for posting them, I look forward for more super-special-awesome chicken recipes! I made my very first bento today for my husband’s birthday - safe to say he was impressed! These burgers are surprisingly delicious given the short list of ingredients and how easy they were to prepare. I made a batch of 14 burgers last night, and have frozen 10 of them for another day. I’m so excited about getting started with bento and love love love your recipies and style. Thanks! I’ve been looking into the whole Bento idea for a while now and its recipes like this that has my husband coming on board with the plan. Thanks so much for all the great ideas and recipes, I’m really looking forward to making this a part of our life. At the moment I’m wondering if you could substitute ground pork for the dark meat chicken, mainly as its what is in the fridge at the moment but also because reading this site makes me hungry! Thanks for all the hard work you put into this site. You could use ground pork, though it will have a different texture. It’s the chicken that gives this its unique, soft texture. But a pork version should taste great too! Thank you for providing the recipe for the dumplings. I substituted the chicken for turkey (ground store bought) and it can out great, not as nicely textured as your pictures, but still looked and tasted fine. I saw these on the drama Nobuto wo Produce, and was wondering how to make them. Thanks again!!!!! Hi Maki, I love your blog. It helped me get started with packing bento lunches and just today, I was researching on tsukune rice burgers when your recipe jumped out at me. Thanks for sharing such wonderful resources and I’ll let you know how my burgers went. I got home and made the chicken tsukune following your instructions and they turn out fantastic. Thank you! I used a bit of oyster sauce. These have always looked tasty to me but I just never got around to making them. Today, since I had some ground turkey that was approaching the "you'd better cook me" stage, I thought I'd try turkey tsukune. They were so yummy! I was worried about them being a bit dry because it was turkey breast, but they came out great. For the stewed version I used broth instead of water but kept the other ingredients the same. The oyster sauce is the perfect touch for the mini-burger version! so tasty! Thank you Maki! These are so tasty! I don't have a food processor but I had the good fortune to find some ground chicken. However, I couldn't grate the carrot very finely and the little shreds didn't mix too well -- you bite into a dumpling and see a bunch of carrot shreds mixed in! Does anyone know of a way to cut the carrots up finer with just a grater and a knife? Thanks! Re: These are so good! You could sauté the carrots a bit before mixing them in. This would soften them so they blend in better. Or you could grate them on a microplane grater, which is a good thing to have for all kinds of grating tasks. I just discovered your blog some days ago, but did yet feel the urge to try a few and I have to say: thank you!! Everything tasted just great :) especially these dumpling-burgers! I tried both fried and boiled and can't even decide which one's better ^^. My food processor is pretty old and ran hot before everything was finely chopped, though. But this turned out to be a nice coincidence as I now have some whole pieces of chicken inbetween P: THANKS! I was wondering if this can be made with chicken breasts as well, I'm allergic to types of red meat. White meat can be used, but you may have to add some oil to compensate for the fact that it's lower in fat than dark meat. Otherwise, it may turn out a bit dry. 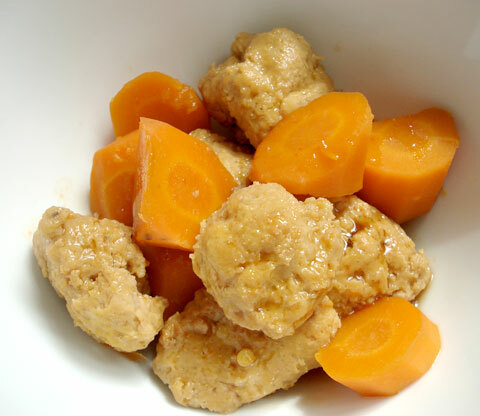 I've also found that although ground chicken breast can be drier than ground thigh meat, if you don't eat it up immediately the stewed dumplings will soak up enough of the liquid to become soft. Sadly, this doesn't apply to burgers - but still, both the burgers and fresh dumplings are delicious (if marginally less so) if made with chicken breast meat. I wouldn't let not being able to find ground chicken thighs keep you from enjoying the delicious delicious tsukune. Wow, I made the stewed dumplings and they're amazing. I didn't seem to have the dexterity to do anything useful with two teaspoons, but rolling the paste into balls with wet hands seemed to work fine. I was amazed how much the dumplings puffed up on cooking - I put too many in the pan at once, and they all squashed up together. Holy chicken! Thank you for this blog - you're a genius. I've been following your blog for a while - and feel incredibly blessed with what your blog offers in terms of sustenance. Hope that you are well.